Mountain Security: combining cutting-edge and evolving technologies, such as APR and pyrotechnic explosives, SNIPER brand systems redefine the concept of security in mountain areas. The SNIPER project was created in response to the needs of the various operators in the snow sector in the context of Security and Avalanche Prevention. The SNIPER System solves the problem of loosening and securing mountain trails and roads from Avalanche danger. We believe that the technological progress we are witnessing possesses the characteristics necessary to make significant improvements in the most varied activities. Starting from this concept, we have developed we have developed a futuristic project that sees the most sophisticated technologies applied in the field of Mountain Security and pyrotechnic explosives. 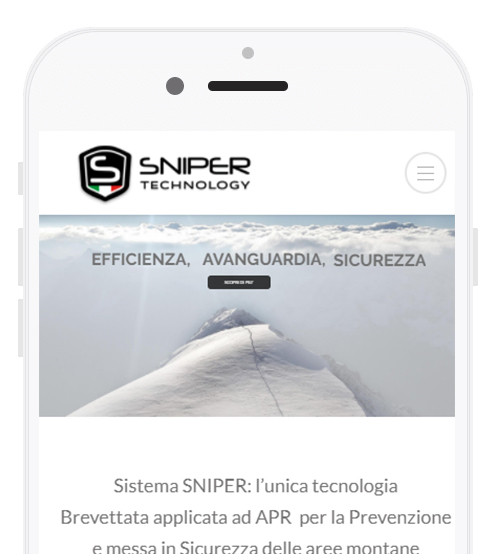 It was developed by the internal team made up of the best experts in the sector on a national level, SNIPER Technologies completely revolutionise the concept of Security in the world of snow, bringing significant benefits with the primary objective of Prevention and safeguarding human lives. The SNIPER System, combined with the SNP Pyrotechnic Explosive and applied to the appropriate SNIPER Drone and fixed pulley systems, allows for operating with extreme security and precision. The SNIPER system for manual loosening was presented to complete the SNIPER Technologies in 2017.